One of few juices that is excellent fresh, out of the bottle. No chemical or artificial undertones. Well balanced lemon+vanilla palette, not too sweet. Produces consistent flavour under low and high wattage and plenty of vapour (high in VG?). Definitely recommended. buddy bought a bottle from here and told me all about the cereal/fruit loops trend… i didn’t care as i was into my custards but as soon as i tried his looper, I suddenly found my self getting bored of the custard taste and looking more into the cereal flavors. It really does taste like fruit loops with a bit more of the lemon flavor being more distinct… but with the creamy and sweet undertone that it has, its quite amazing! Getting my bottle as soon as i can! I bought three bottles as soon as I saw this was available – very hard to obtain for us Canadians. This one is well worth the price. Excellent company, and this is the best of their line, in my opinion. I’ve had several cereal juices, and this one is the most balanced, flavourful, and easy-to-vape cereal I’ve ever had. Definitely an all day vape for me, and even though I tried to reserve this juice as an occasional treat those three bottles disappeared quickly. This is not a juice for those who want throat hit. I’m not a fan of a strong throat hit at this stage in my vaping life, so it was a perfect juice for me. I would thoroughly recommend this liquid for anyone looking for a mouth-watering, fruity vape! Tastes just like the cereal. It’s a smooth vape and wicks in any build I have tried, tank or otherwise. Great juice. I’d prefer more milk flavor and that’s why I only give it 4 stars. Best cereal vape yet. Definitely buying more. Tried Carnage on to Looper. I found this extremely realistic when it came to the cereal for which its named. Nice dense vapor, smooth all around! I enjoyed it best at around 22 watts in the Atlantis V2. Brings out the toasted undertones!! Another delicious addition to my juices! Unbelievably accurate. Its fruit loops, right down to the drinking the milk with the little cereal fibres left in it afterwards if that makes sense. It’s the best cereal vape I have ever had. This is an amazing flavor. It reminds me of fruit loops and it is so delicious. This is the most accurate representation of a good fruitloops bowl of cereal I’ve ever had. This is my official new all day vape. the presentation is even really perfect. The quality of the artwork is insane. This just feels like someone *finally* put some care into their presentation. REALLLLYYYYY enjoying this liquid. Would 100% recommend it to anyone. Will absolutely be picking up more in the future. Best cereal vape of all time. Too bad its so expensive but its great for mixing as the looper flavour takes over even at small ratios. I have tried many cereal flavours and the only one coming close is kilo cereal milk. It is also very good however looper is still the best. I ordered my very first bottle of Looper from Ace Vaper on Tuesday and had it in the mail on Thursday. This stuff lives up to the hype. I vaped it in the new TFV4 which I also order Tuesday from Ace Vaper at 120 watts with the triple coil in. Huge clouds and unbelievable flavour. I`m driving up to this store this Saturday!!!!!! Looper is the king of Froot Loops in the vaping world. A perfect blend of fruits, cereal and cream. I’ve tried over 30+ cereal vapes and I always keep coming for more Looper. I have over 20 empties of Looper, nuff said. 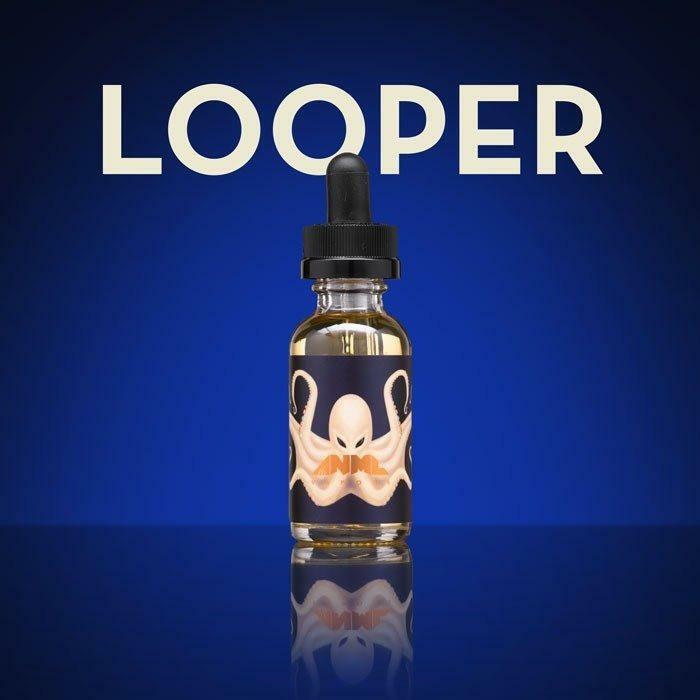 There is no doubt that Looper is one of the best ejuices available on the market today. Honestly not incredibly impressed with this juice. On my RDA, this actually tastes quite floral with notes of perfume. It oddly tastes more rounded and much better through all of my sub ohm tanks, however. While the flavour is nice, I wouldn’t say it’s very accurate. Kilo’s Cereal Milk was much better tasting with a much more balanced flavour to me, and didn’t taste nearly as artificial as this. In fact, I wouldn’t even say it’s on par with some of the generic brands I’ve tried that were going for the same flavour. The bottle I was given is also extremely prone to leaking around the dropper lid. No matter how I screw the dropper on, after an hour or so of letting the bottle sit, I have to wipe it down due to leaking. Not a bad juice or fruit loop flavour, but it’s not the greatest either. I don’t think I’ll be buying this again. A++++……if I could give this one ten stars I would. Best cereal vape that I have had to date. Very smooth. Zero throat hit, and good vapor production. No single flavor overpowers the others, which is what to me makes this the king of them all. Tastes like a high quality, premium juice should, though what would one expect from the Phillip Rocke line. Honestly, I buy this one 60-100ml at a time. It is that good!!!! The only one that I like nearly as much as this is Hype by junkie juice. Hype however I find is not blended quite as well, with some of the flavors overpowering the others. Makes it tastes like it is a little lower in quality…..though I would also recommend that one. Just don’t expect the exact same flavor profile. They are very similar, but looper is just blended a little better, so that the individual flavors mesh together in a way so that in each vape, you get all of the flavors at once. If you order this, and only pick one bottle up, you will be sad that you didn’t order more. It will vanish before your eyes. Always in my rotation, though it is never around for very long. The hype of this juice brought me to Acevaper so I will forever be grateful to this juice for that. It is as most people describe, the best fruit loops vape available. This is the juice that got me to quit smoking and I vaped nothing but this juice for over a month. Doing so somewhat ruined it for me and now I get sick of it quickly but I will forever remember those first drags. Phillip Rocke is a flavoring savant and I can’t wait for Acevaper to get his newest creation; Fury. 10/10 Obviously. Don’t even bother reading reviews, just buy it and fall in love. SPOT ON FRUITY RINGS OF CEREAL THAT YOU KNOW YOU LOVE. I just wish I knew the PG/VG content but seems to be about 70 or 80 VG. Very good flavor. One of my favorite. Please, do it in 60 or 120ml. one of my fav juice. The taste is simply mind blowing . My regular fruit loops flavour was sold out so I thought I’d try this..
Judging by the other reviews I feel I must have got a bad batch. Taste more like a cinnamon dessert flavour then fruit loops. Wow this is delicious. I’ve tried many fruit loop type liquids and this one by far is the best one I’ve tried. I’ve bought almost every one of Philip Rocke’s liquids which I thought were never as good as the hype but this one for me was really good. I find most fruit loop cereal vapes lean way too hard on the lemon side and that’s all you get but this one is very well balanced with the lemon to cereal to milky sweet taste. They finally put down the price of this and it’s well worth it. Tried it on 40-50-60 Watts and it taste great at any level. 0.17 ohms on my Recoil RDA with dual claptons. I could vape this all day. If you do like more of a lemon flavor profile I suggest RainbowRoad by Vapetasia. A little cheaper and close to this but more of a lemon flavor but for me this perfectly balanced ejuice hits my tongue like vape magic. I wished I tried this juice out earlier.